The ruins of Searsboro Consolidated School languish on a hill at the edge of a small town in rural Iowa. Largely obscured by trees and overgrown weeds, the grand structure sits abandoned and heavily damaged by the elements. 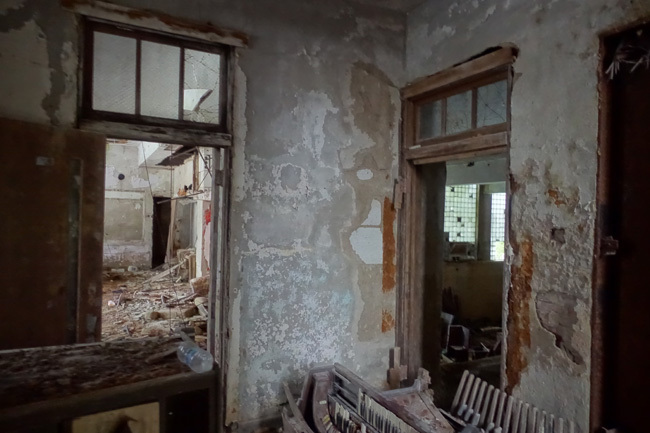 After checking out the ruins of Oak Park Academy and taking a quick look at the old Titan Tire factory in Des Moines, I followed roads less traveled into the rural town of Searsboro, Iowa. I drove through the peaceful neighborhood, admiring the sprawling yards and abundant wide open space. A deep sense of peace permeated the air. The stress and noise of city life felt a thousand miles away. I parked near the old school and cautiously approached. 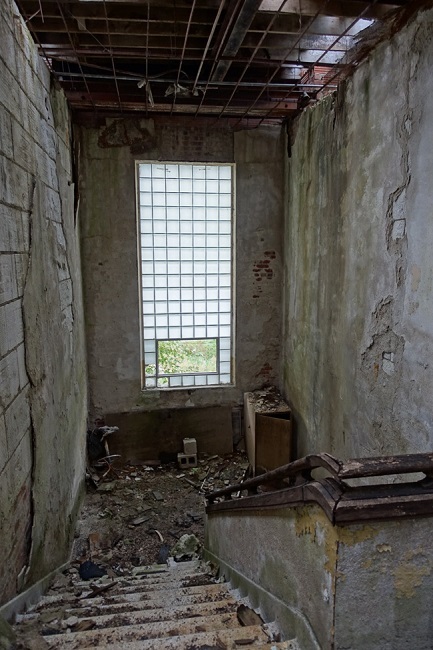 There weren't any signs warning away trespassers and the place looked deserted, so I was pretty sure it wouldn't hurt to have a look around. Still, I didn't want to be mistaken for a trouble-maker, so I peered out at the few homes within eyeshot to see if anyone had noticed my presence. A young woman in her early 20's wandered into view across the road. I gave a friendly wave. She called out to me, saying that her dog ran off and asked if I'd seen it. I told her I hadn't, but I'd keep an eye out. I asked if anyone would mind if I had a look inside the school and she said she didn't think anyone would care. 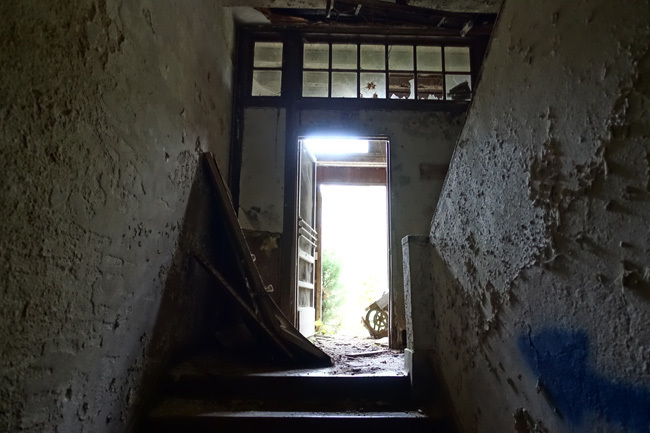 I walked past the front door, which lay bent and rusting in front of the doorway, and stepped inside. 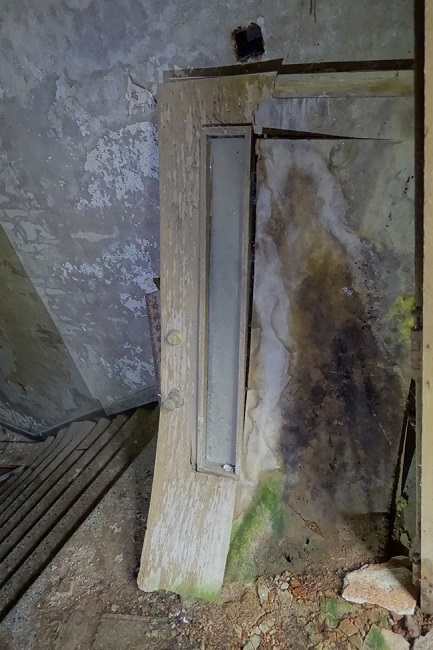 It was immediately apparent that the school was in bad shape. Just beyond the threshold another door leaned against the wall, warped and stained from water damage. From the outside, the building looked sturdy and solid, but the inside told a different story. The paint was peeling from the walls near the entryway. In most places the paint was entirely gone and the concrete had begun to fall away from the masonry beneath it. A layer of damp, disintegrated concrete covered the floor. 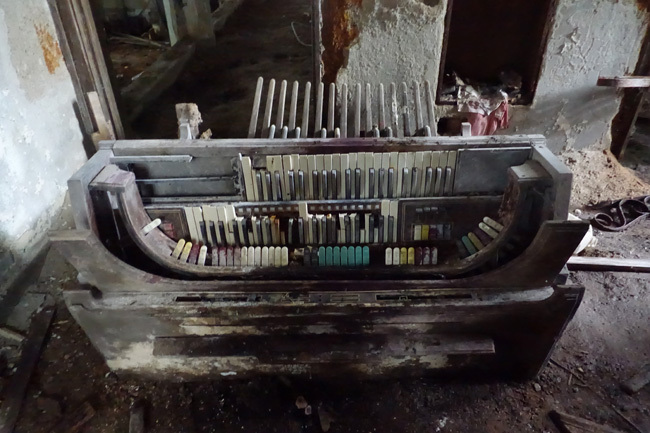 An organ resting on its back greeted me as I ventured deeper inside. 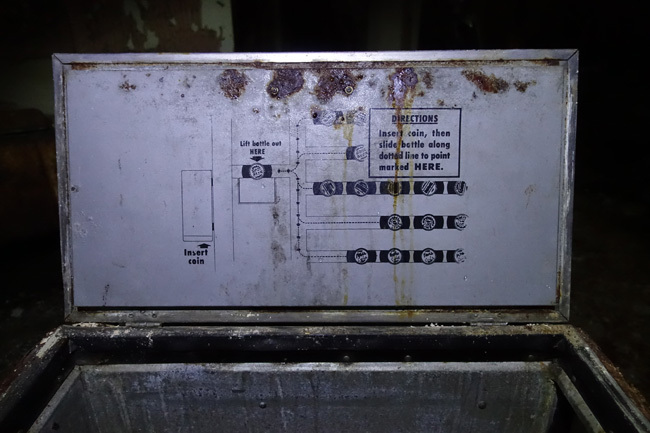 The old school had experienced severe water damage. 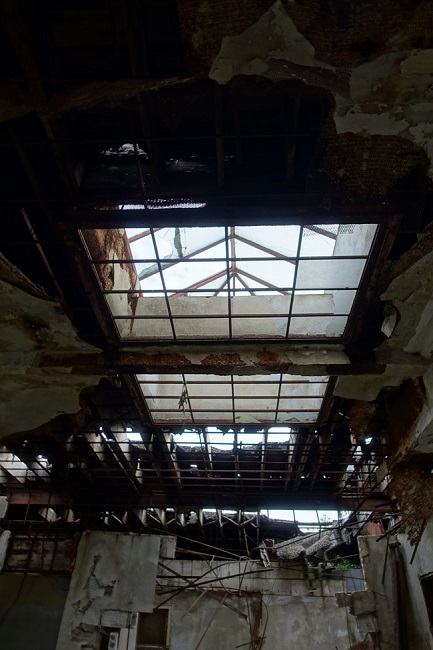 The ceiling had fallen in most of the rooms on the upper floor, leaving a network of exposed beams. I gazed up at a beautiful angled skylight. This old building must have been gorgeous in its heyday. It's sad to see a place like this in such an advanced state of decay. I wandered through the old classrooms. All but a few of the chalkboards had fallen from their rotting wood frames. One door marked "7th & 8th GRADE" was still wedged in place, slanting and ready to give way. I was careful not to disturb it. As far as I could tell its faded lettering was the only signage that remained to indicate what any of the rooms had been used for. I wondered if the former students knew what had become of their school. 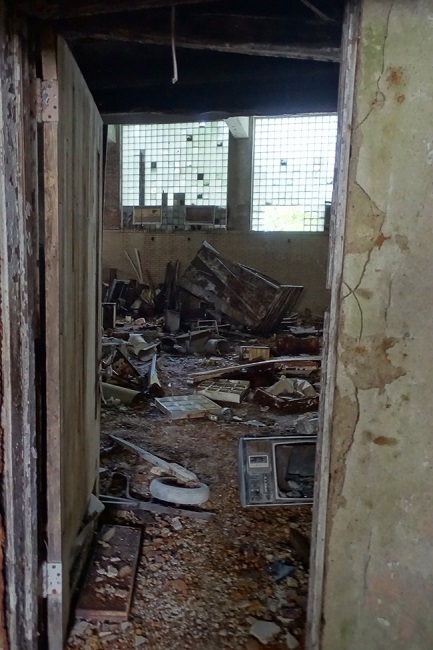 The gymnasium was dark and damp and cluttered with shelving, rusted equipment and a lot of unrecognizable decaying junk. I was glad to find a couple of neat artifacts among the mess. 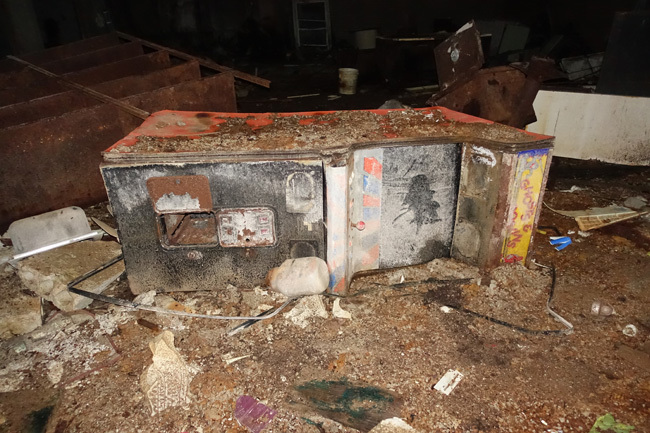 One was an old arcade game that didn't seem like the sort of thing you'd find in a school. It might have been dumped there with other trash after the school's abandonment. 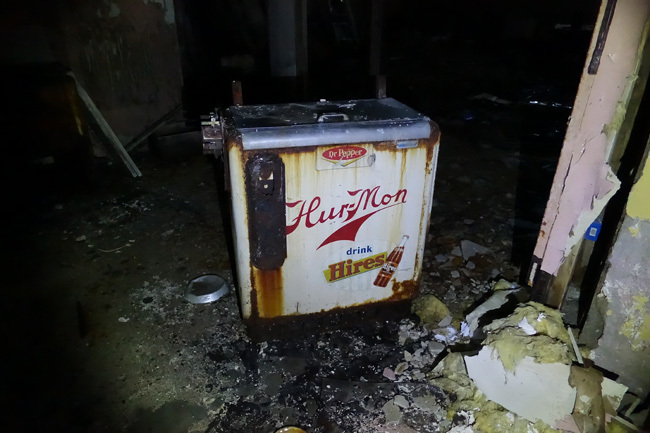 There was also a neat old soda cooler with the Dr Pepper logo on it and a few other logos I didn't recognize. It was an old type of vending machine. The underside of the lid had instructions for how to buy a bottle. Most of the other artifacts were damaged and half-buried beneath a layer of fallen ceiling material. 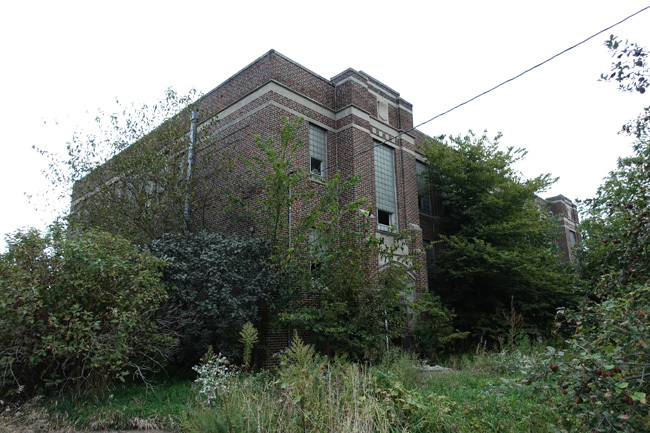 I was able to find very little information about the history of Searsboro Consolidated School. It is unclear when it was built, but its name indicates that it was the result of the consolidation of several smaller school districts into one. When the school closed, probably sometime in the 1980s, Searsboro became a part of Lynnville-Sully Community School District. I've heard, but cannot verify, that the school was later sold for $50 to private owners who lived there for several years before moving out of state. I wonder if they left because of the deterioration of the building. 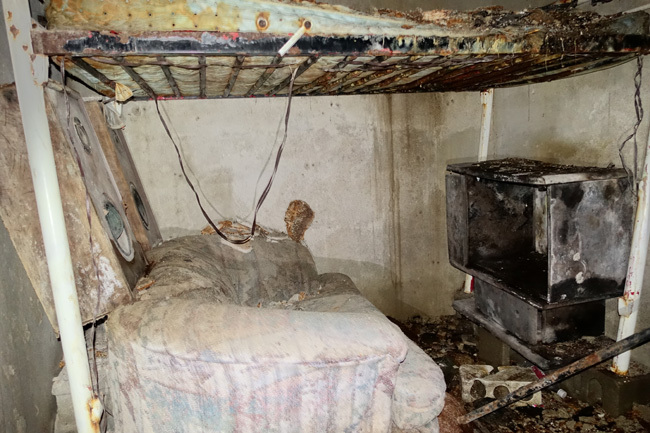 Several bed frames from the former residents remained in one of the classrooms. A closet-sized room inside the school had a dorm-room style setup with a TV, couch and two large speakers situated beneath a lofted bed. Another room was filled with old furniture. 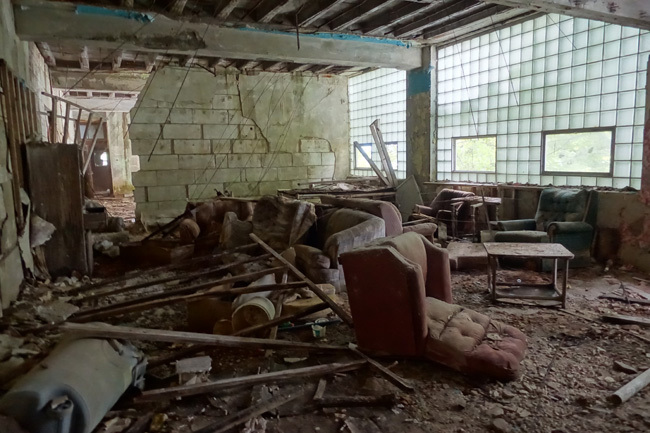 It might have been a teachers lounge, or maybe the furniture was brought in after the school closed. 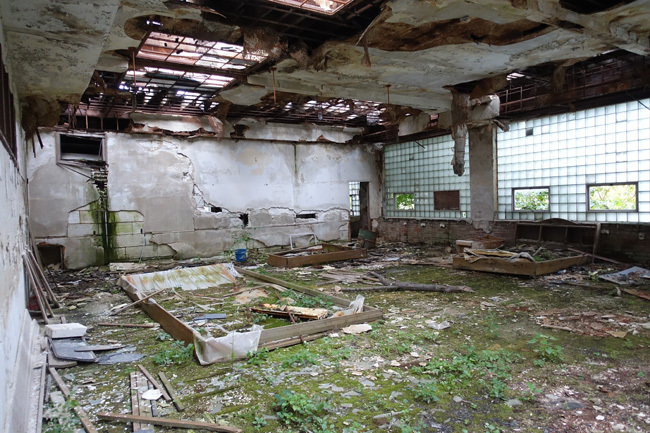 When I'd finished exploring the school, I took a few minutes to scan the surrounding area, hoping to spot the lost dog of the gal I'd met earlier, but there was no sign of it. Hopefully she'd already found it. 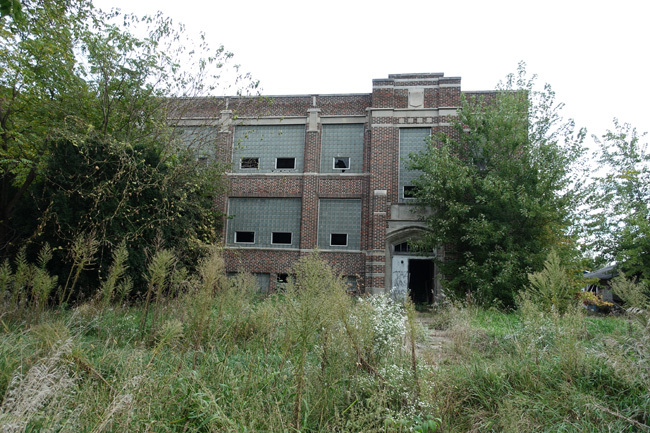 I got back on the road and set my sights toward another of Iowa's abandoned schools. I'll tell you all about it next week. I would love to hear from former students of Searsboro Consolidated School, or anyone who has firsthand knowledge of this neat old place. Please leave a comment below if you have any information you'd like to share. I am always shocked how quickly buildings deteriorate. You don't feel like you do a lot of maintenance when you're occupying a space, but wow-when people are gone, it goes fast. We're heading into Iowa today. Looking forward to a couple days of cruising the back roads. Thank you, Sue. It's amazing how small cracks and leaks turn into massive water damage over a short period of time. I bet this area gets a lot of rain too. I wonder if the people who lived there attempted to do some work on the building. That would explain some of the missing sections of wall. Have a wonderful time in Iowa. The scenery is so beautiful. I need to make another trip out there before too long. Another great post! The interiors looks amazing and creepy! Thank you, my love. It was such a neat place to explore. I loved how the plants were growing up out of the floor on the upper level. 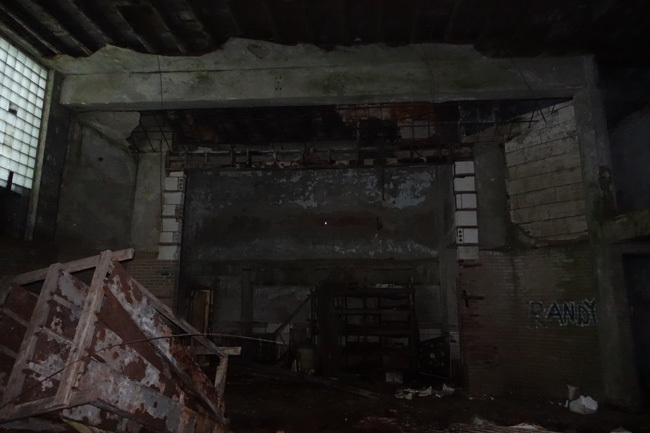 The basement was definitely creepy and very dark. As usual. Your work is incredible. You make me feel as if I am right there when you create these articles. Thank you and keep up the fantastic work. No, but there is nothing to stop anyone from going in. KInda creepy, but very interesting. Interesting, my grandfathers grandmother was married to a McDowell, Levi McDowell was his name, hers was Martha Stanley. Any of that sound familiar? I don't know about this building but Levi and Martha are my great great grandparents too. Their daughter Lucinda is my great grandmother. Would love to share family info you have. I would like to know more about it too. I wasn't able to find a whole lot of historical information. Wow! Amazing work! I am fascinated with the history of school consolidations in Iowa. It seems like every year school districts are consolidating, due mostly to the fact that the funding for rural schools is just not there. Because of this, more and more schools close in small towns. 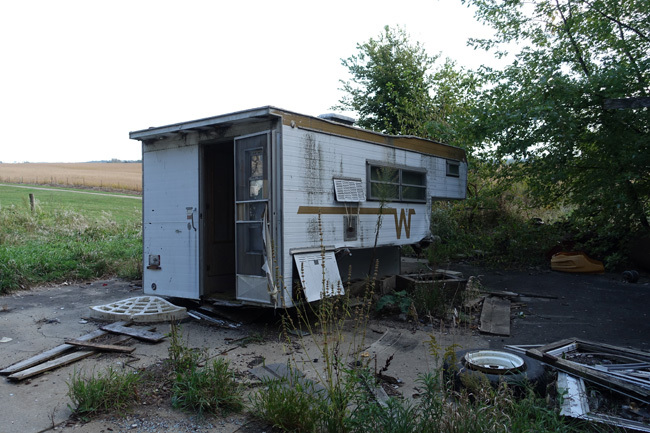 I remember driving in the countryside through a ghost-town known as Carrollton in west-central Iowa which used to have an abandoned school building. From the road, this building was very visibly in decay. A person could actually see the second floor caving in on the main floor. 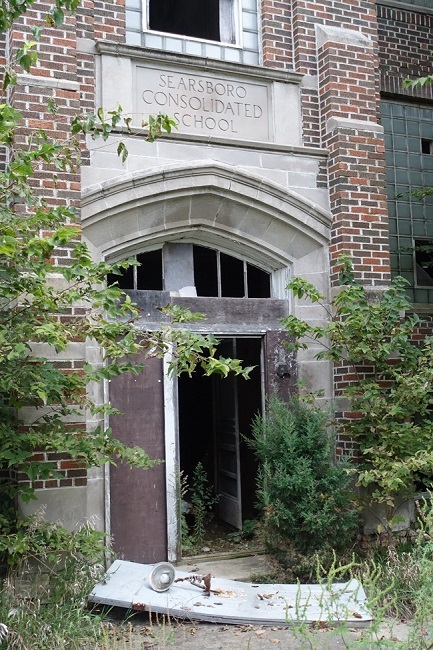 Unfortunately (or perhaps fortunately), the school was tore down a few years ago. Thanks Josh! I wish I could have seen the Carrollton school when it was still standing. I grew up in Searsboro from 1995 to 2000. My family has lived there most of their lives. My best friend growing up lived with her parents in that school. I have some very fond memories and some not so fond there as well. They did what they could and it was very nice on the second floor when they lived there but not sure her parents realized how much effort it was going to take to make that place a great home. I feel sad it came to that but yes after they moved it was forgotten. I remember playing that ghost and gouls arcade game for hours it was very fun times. I really miss my friend and we've kept in touch all these years but it's been difficult trying to keep up on everyone anymore. It must have been such an amazing place to make into a home! It's sad that the upkeep became too much. You must have some great memories from there! Hello. My name is Jeremiah. I just recently conducted a paranormal investigation in Pella Iowa. Not too far from Searsboro. I was randomly interviewing people after the investigation, and a lady told me about the school, and suggested that I investigate there. Ironic as you are mentioning playing ghosts and ghouls there in the past! Did you experience anything paranormal during your time in the school? 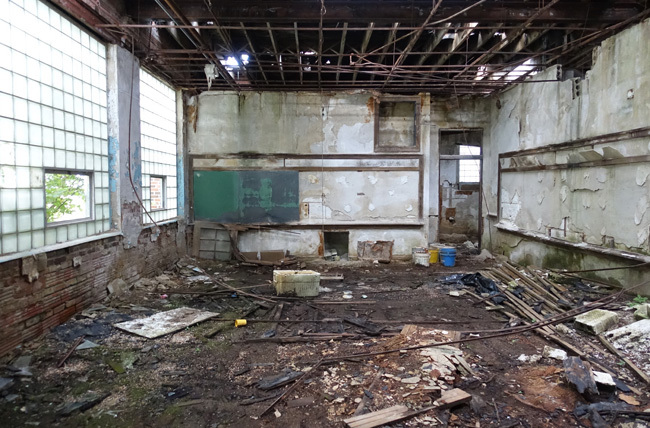 Please don't visit Searsboro's abandoned school. 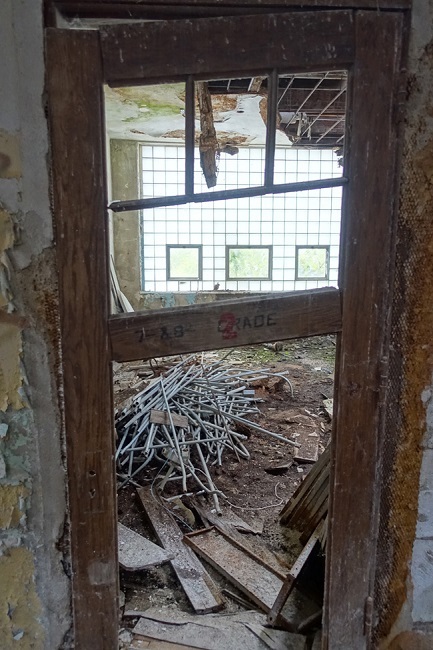 There is too much attention drawn to the unstable structure and kids want to venture in and explore as it is. If we as townspeople see anyone messing around there, the Sheriff does get a phone call. Last week a Deputy came when they were called and took a couple people out of there. It was posted "No Trespassing" but vandals have tore the signs down and they sit in the weeds decaying, just like the building. I have lived in Searsboro 14 years and walk by this building quite often. I do not believe there are any residual ghosts or other hauntings present there for you to investigate. It would just draw unnecessary attention to a dangerous, dilapidated sad old building. My mother (Gayle Newport) and aunts attended the school, my mother graduating in 1952, I believe. My grandfather (John) for years was the custodian. 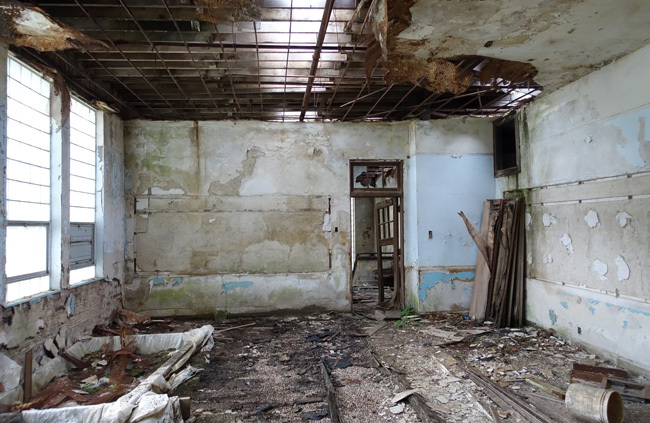 The building was still in use in the mid 70's for part of the students of the consolidated school system, Lynnville-Sully. 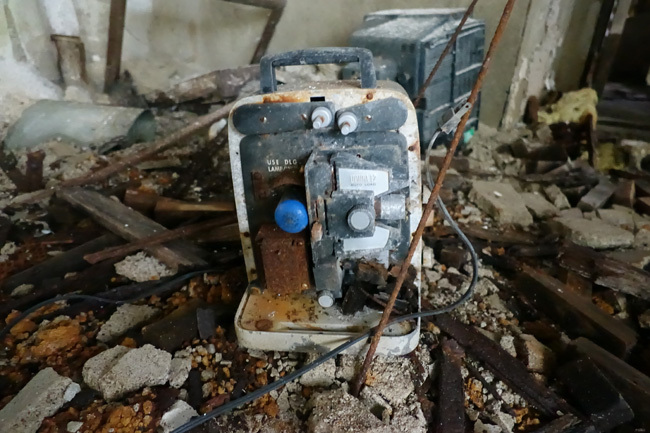 At that time, the building was showing some decay, but one could still see how beautiful it had once been. I have many fond memories of Searsboro in the 60's when there was still a "downtown" and as a child we could play freely. We knew whatever we did would be reported to my grandmother before we returned to the house (LOL! ), so our adventures were wholesome, but fun! I agree that entering the building would not be advisable. It has not been safe for years.